Some people might find it surprising to learn that Tom and I were away from the Catholic Church for 10 years. My own 16 year old daughter questions how we could have ever left the Eucharist, especially after I witnessed a Eucharistic miracle first hand and started a household devoted to the Eucharist. I don't have an easy explanation for that. The only thing I can think of is that we did not fully grasp the infinite level of intimacy available to us by receiving Jesus' body and blood. When I was in my early 20's, we were more about doing and being involved in ministry. We did not have an understanding about resting in the Lord and allowing him to transform us from the inside out. Since we were all about doing ministry, it was easy to become frustrated as we kept running into brick walls. The parishes we were involved in had much different views of ministry than we did. One thing I always loved was Eucharistic adoration. I even tried to start up perpetual adoration at a parish we attended to no avail. I think for me, it was all about experiencing God's presence which I definitely experienced when I went to adoration. I think it takes a little more contemplation of the mystery when we receive Jesus at Mass and unless we are able to contemplate this mystery, we may not experience his presence. Since, for me it was all about experiencing his presence, well I could do that while worshiping with my Protestant brothers and sisters. Tom and I were also longing for community and to be around other like minded young adults like we had at the Franciscan University. This was hard for us to find at the parishes we were involved in. We were able to find this however at a local Protestant church. Our original plan however was to get involved with the Protestant church but also attend Mass on Sunday. After a while it became too hard to keep doing both so we stopped going to Mass. I ended up having a pretty profound dream after being away for about a year. I did not realize the full meaning of the dream however until nine years later when we were praying about going back. The dream started with me walking down a hallway. I came to the end of the hallway and there was a door. I opened the door that led to the outdoors and a platform. I walked out on the platform. I saw Jesus sitting against the outside wall talking to a guy. I then proceeded to walk to the edge of the platform that was also surrounded by a 3 foot wall. I looked over the wall and there was a florescent green river in a valley and it had thousands of flamingos wading in it. I knew I needed to get to the land that was on the other side of the river and the only way I saw to be able to do that was to cross the river with all the flamingos. I proceeded to climb over the wall of the platform so I could cross the river and as I did many flamingos started coming up over the wall and attacking me. I realized that was not the way I should go and I climbed back over, onto the platform. I then walked back over to the door and tried to open it, however it was locked. Jesus then stood up and he had a key so he unlocked it for me. He then led me back through the hallway in which I had come. He also led me to another door and opened it for me. We walked through the door and there was a beautiful redwood forest. He said to me, "This is the way you should go." Tom and I did a pastoral internship at two different non-denominational, evangelical churches. We also ended up starting a house church that we pastored for 4 years. Everything was going pretty well. Our church was growing and we were able to branch off and form a second house church. The local paper even did an article about us and it was on the front page of the paper on Easter Sunday. We never had any doctrinal problems with the Catholic Church so a lot of what we did at our church was very "Catholic". We baptized babies and even had weekly communion. We thought if we had the faith, Jesus would be just as present in our communion but it was different. We began to really miss the Eucharist and a sense of the sacred. We began to pray about whether we should return back to the Catholic Church. When I was praying about it, the flamingo dream came to my mind and the interpretation hit me like a ton of bricks. It suddenly became very clear. The first thing I did in the dream was walk through a hallway and walk through another door. I believe this represents walking away from the Catholic Church and going over to the Protestant side. It is interesting to note that Jesus was still there. In my dream, he was hanging out on the platform, I believe mentoring a guy. I looked over the platform and felt I needed to get to the land that was on the other side of the river. I think this represents our desire to do ministry and believing the way to be able to do that was to cross over to a particular denomination that we ended up joining. In the river were flamingos. Flamingos are pink which is a white-washed red. Red stands for the blood of Jesus, the passion, the cross. If it is watered down, white-washed, I believe it represents a cheapened form of the cross or what Dietrich Bonhoeffer described as "cheap grace" which is grace without the need for repentance and change. In his book, "The Cost of Discipleship" he says, "Cheap grace is the preaching of forgiveness without requiring repentance, baptism without church discipline, communion without confession, absolution without personal confession. Cheap grace is grace without discipleship, grace without the cross, grace without Jesus Christ, living and incarnate." This pretty much sums up what we encountered at the churches we participated in. There seemed to be a lot of talk about grace and even grace extended to people involved in serious sin however, there wasn't a whole lot of grace extended to your average person in the pew. This explains how in my dream I was being attacked by the flamingos. Although we did have some good experiences and encounters with the Lord, being attacked by the flamingos sums up my experience at the evangelical churches we attended. It should be interesting to note however that Bonhoeffer was not Catholic and I do not believe that all Protestant churches give into cheap grace and being seeker sensitive. 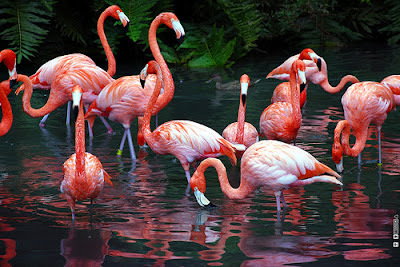 Another fact about flamingos is they stand on one foot. I believe this stands for Protestants holding to Sola Scriptura (scripture alone) whereas Catholics are grounded in Scripture and Tradition. If you hold to Sola Scriptura, you only have one leg to stand on and it may not be as well balanced. Flamingos are pink because they eat shrimp. Shrimp eat the scraps off the bottom of the ocean. They were also wading in florescent green water. Green stands for life. The green the flamingos were standing in was a florescent green which I believe stands for it not being real. There is a better way, a more real way and that is to eat from the tree of life which is Jesus himself in the Eucharist. He is the bread of life, real food and real drink for our souls (John 6:35). I then decided in my dream to go back through the door in which I came from but it was locked. Jesus had a key. It is only by his grace and mercy that we came back. He then led me to another door that led to a beautiful redwood forest. The redwoods are the most ancient of trees. They have stood the test of time.There are some very interesting facts about the redwoods. For instance, they have some unique survival tactics. Their bark is up to a foot thick in some places and when exposed to fire forms a heat shield that protects the main part of the tree. Redwoods have a chemical composition that is distasteful to termites and ants. Redwoods are also very resistant to water rot. There are many more interesting facts that you can read about redwoods here. When we were praying about whether we should return to the Catholic Church, suddenly it became obvious to me, the correlation between the Catholic Church and redwoods. Like the redwoods, the Catholic Church has also stood the test of time. She is ancient, founded by Christ over 2,000 years ago. Despite many trials, tests and sinful people, the teaching and doctrine of the Church has survived and has been unwavering. It feels very safe to me that the bar is set pretty high in the Catholic Church. There is still sin but the Church makes it clear that it is sin. When you lower the bar and allow anything to go, it does not feel very safe. Churches that are being "seeker sensitive" and watering down the gospel in order to win souls are not really doing anyone a favor. If people are coming to Jesus under a "gospel" that says, "Come to Jesus and all your needs will be met." or "Come to Jesus just as you are and you don't have to change" are really doing people a disservice. As soon as these people encounter trials or the storms of life, which they will, they could easily lose faith. I am very happy to be back in the Catholic Church. It is not perfect. There is still sin and I am still longing for more of a "sense of the sacred" but I know that Jesus is there and is present in the Sacraments and in the Eucharist. That gives me comfort and peace and I couldn't imagine ever leaving again.